I know, I know -- juice bars are trendy so that's why all the city folk are going to them. If you don't live in a big city, you may not be fully aware of this trend, but it's likely you've heard of it. The truth is that outside of New York City, there aren't a lot of juice bars that are making their juice by cold-pressing it and not pasteurizing it at all. That's where Cocobeet comes in. 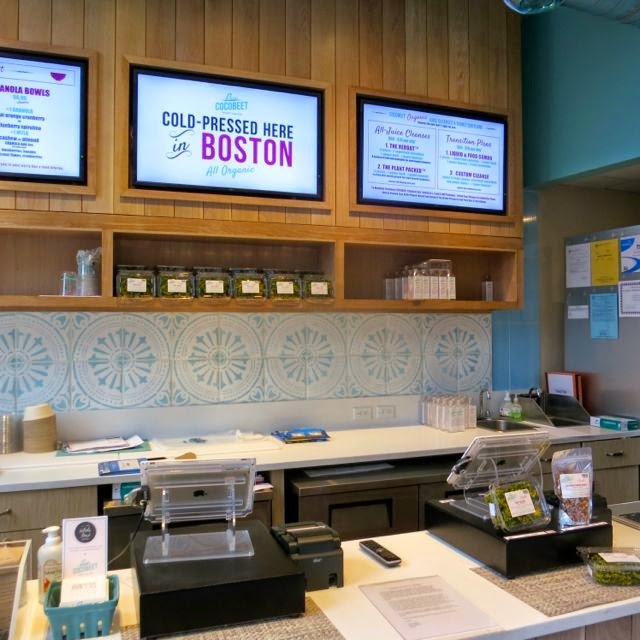 Located in the heart of Boston, this new takeout joint is not only a great place to get fresh, raw, cold-pressed juices, but a great place to get grab-and-go healthy food too. 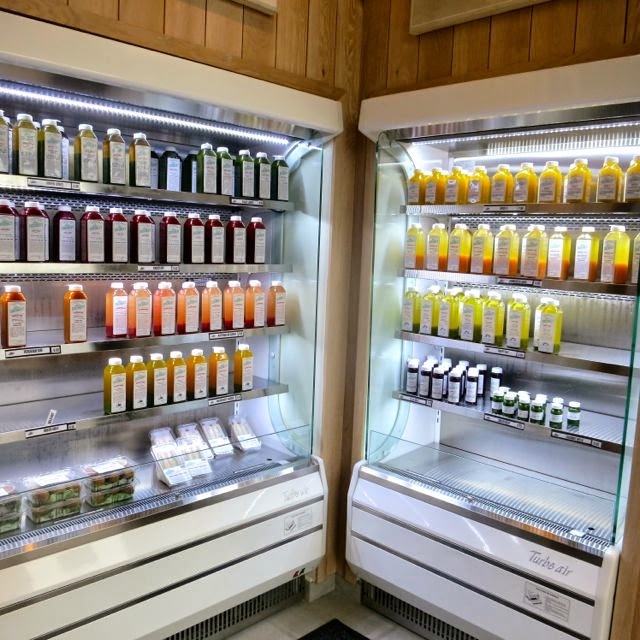 All of the products they sell are unprocessed, GMO-free, organic, locally sourced, raw and vegan. There are gluten-free options as well. I ended up there the day before a national holiday so there weren't too many products prepared for the day. But, what they had looked great. The juice selection, on the other hand, was well-stocked. I had so much trouble choosing with flavors like the Spice-C made with orange, ginger, and jalapeno and the Watermelon Quench made with watermelon, pineapple, and lemon. I finally settled on the McGregor's Garden made with spinach, parsley, carrot, celery, and lemon. 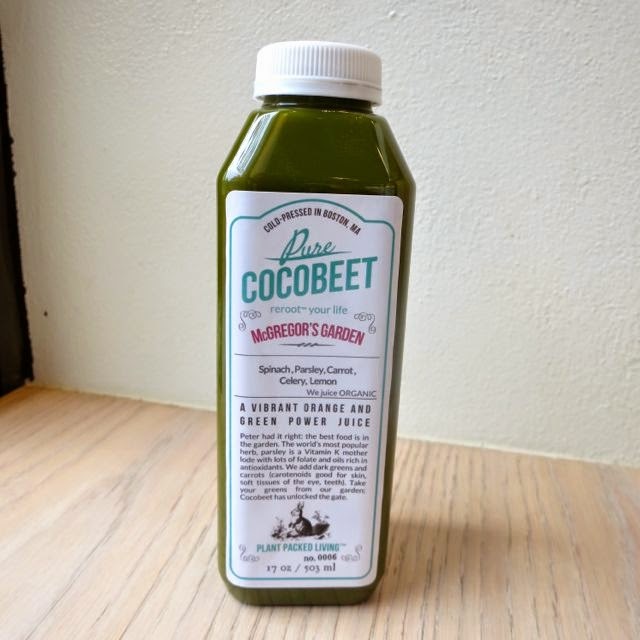 One of the owners, Onur, happened to be there and I was telling him how much I liked this juice as I love green juices and he told me that that juice was his favorite too, but the customers' least favorite. Most people want a sweet juice, not a green juice so they may not be ready for the green goodness inside! 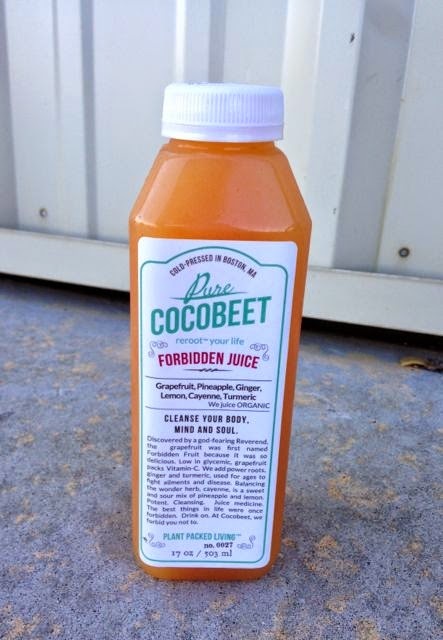 I also tried the Forbidden Juice made with grapefruit, pineapple, ginger, lemon, cayenne, and turmeric. I loved this one too...and it was sweet. It is a very balanced juice with more pineapple taste than anything else, but with a little kick of cayenne. The cold-pressed juice process creates juice without using heat that could kill off the vitamins, nutrients, and enzymes. So they produce the freshest, most nutritious raw juice this way and it has a shelf life of only four days. Most people don't realize that most made-to-order juices that you get on the spot while you wait are created by machines using centrifugal force. The end result is a juice that is 80% water and 20% nutrients. The enzymes and nutrients are neutralized or destroyed, and the spoilage process begins immediately. For lunch, I had their Avocado and Spinach sandwich on sprouted grain. It was about as good as a pre-packaged sandwich could be. 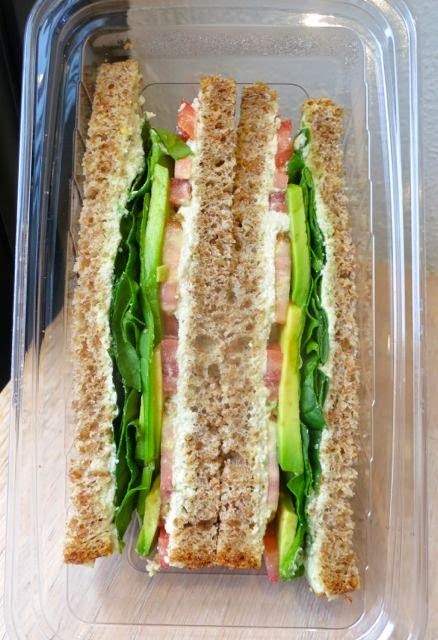 Usually sandwiches that are prepacked don't taste fresh and get soggy, but everything at Cocobeet is so fresh, I doubt any of it ever gets that way. The real star in this sandwich is the homemade cashew cheese that gives the sandwich a great flavor. 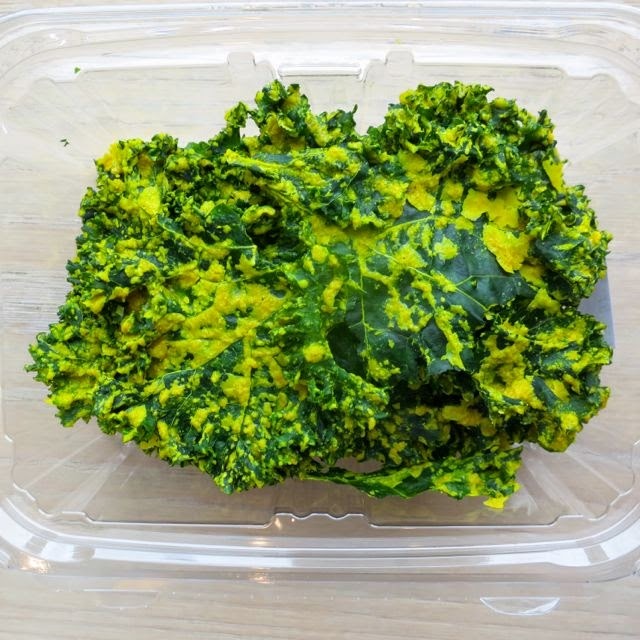 I also picked up a box of their Cheesy Kale Chips and these are by far some of the best kale chips I've ever had. As they are made fresh there and not shipped anywhere else, the kale leaves are full and intact. The seasoning has a sort of mustard flavor to it. Made with cashews, sunflower seeds, nutritional yeast, onion powder, garlic powder, turmeric, lemon juice, and cayenne -- the flavor will blow you away. 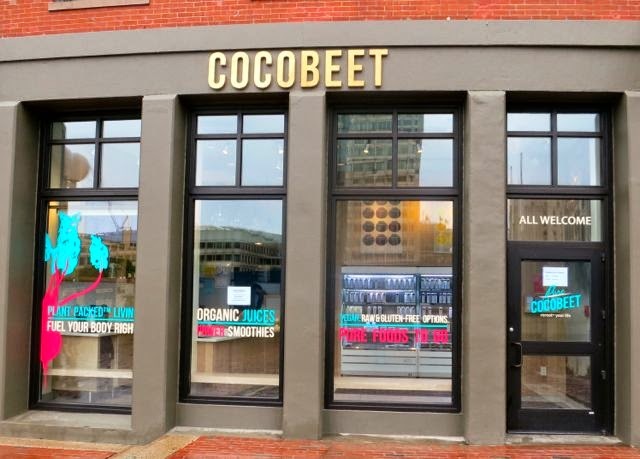 When Cocobeet first opened, they put honey in some items. Since then, they've gone 100% vegan so any reference to honey is only on the package because they printed thousands of labels and want to use them up before replacing them. This isn't a bargain lunch spot as fresh organic food is never cheap. The juices sell for $7.50 to $9.95 for a single serving, sandwiches are $5.95 to $8.95 and salads are $8.95. They also offer smoothies, warm quinoa breakfast bowls, key lime pie, chocolate coconut truffles, and veggie quinoa sliders. There isn't any seating so it is take-out only, but it is so worth the trip. Just find a spot outside and enjoy your healthy lunch. I only wish DC had a place like this. It was like my dream come true, but in a city far, far away. The people in Boston are lucky SOBs.